Cleveland, OH, USA; Cleveland Browns head coach Rob Chudzinski reacts to a call during the first quarter against the Jacksonville Jaguars at FirstEnergy Stadium. BEREA, Ohio — It’s hard for Browns fans to look around the NFL and see teams turn things around in less than a year. Especially, when the Browns continue to talk about building for "long-term sustained success." I grew up as a Browns fan. I know the frustration. I’ve lived it. There’s nothing more than what I want than for this place to be a winner and turn it around and we will get that done. Among the teams that hired new coaches, several are playing for the playoffs this week. Meanwhile, the Browns have to beat the Steelers next Sunday just to equal their five win total of a season ago that resulted in the firing of Pat Shurmer. — The Chiefs were 2-14 in 2012 and are currently 11-4, already clinching a playoff spot. Their key moves were hiring Andy Reid as coach and acquiring Alex Smith as quarterback. — The Eagles were 4-12 and are currently 9-6 preparing to face the Cowboys for the NFC East title next week. Their key moves were hiring Chip Kelly as coach and Nick Foles emerging as quarterback. — The Bears, who were 10-6 in 2012 and fired Lovie Smith, are 8-7 and play the Packers for the NFC North title next week. Marc Trestman was hired as the coach and the Bears offense became high-powered, averaging over 28 points a game. — The Cardinals are 10-5 and host the 49ers with playoff hopes alive. Bruce Arians was hired as coach and Carson Palmer became the quarterback. — The Chargers are 8-7 and whether they make the playoffs or not will not have a losing season. Mike McCoy became the coach and the Chargers have been competitive most of the season. Other teams with new coaches are the Bills (6-9) and Jaguars (4-11). The Jaguars have won their four games in the last half of the season. There are common denominators, namely being a stable starting quarterback. Rob Chudzinski has had to use three different quarterbacks and while having no running game on offense, but he’s not using that as an excuse. 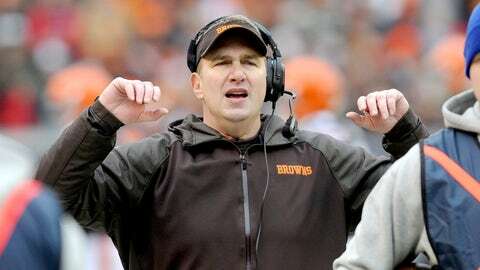 "I don’t think that way," the Browns coach said. "I don’t function that way. I always think whatever situation you’re in, you have to figure a way to make it work. It’s a puzzle that you have to figure out how to put together. Obviously, we haven’t been able to do that this year." Chudzinski said there have been several areas that have frustrated him, but letting games get away that should’ve been won bother him the most. "Looking at the last few weeks we’ve had leads, have had good starts, started fast and haven’t been able to maintain those leads," he said. "It’s been for different reasons and that’s the difficult thing is to pin it down to one thing, you can fix it. Sometimes, you fix one thing and something else pops up." Chudzinski said that he still is convinced the Browns will turn it around. "There’s hope," he said. "We’ve made strides in some areas. Certainly, after yesterday’s game nobody is happy with the outcome. There is a group of guys and a core for the foundation and going into the success we’ll have in the future. "We have a lot of work to do and there’s no doubt about that," he said. "I’m very confident in the future. I’m not immune to what our record is and it’s not good enough and we’ll improve on it." Chudzinski was asked on Monday if he understood why Browns fans are so disillusioned with the seemingly endless seasons ending in despair. "I grew up as a Browns fan," he said. "I know the frustration. I’ve lived it. There’s nothing more than what I want than for this place to be a winner and turn it around and we will get that done." — QB Jason Campbell was quoted after the loss to the Jets that he was pressing. Chudzinski was asked if that’s good for the team leader. "I think pressing is good to some degree because it means guys want to do well and are doing everything they can," he said. "Sometimes, it’s an issue when guys try to do too much. You have to let the game come to you at that position. When he’s been at his best he’s doing that." Campbell was just 18-of-40 for 178 yards with no touchdowns and two interceptions. His rating was a season low 37.3. — WR Josh Gordon and WR Greg Little had passes that could’ve been caught for touchdowns but were dropped. "It’s a matter of catching and making the play at that particular time," Chudzinski said. "There’s other times when a better throw or a misconnection on a play." — Rookie LB Barkevious Mingo has just 5 sacks on the season and 12 hurries, not big contributions from the sixth overall pick in the draft. "Barkevious is going through the transition that a lot of rookies go through in transitioning to the NFL," Chudzinski said. "He’s working his way through that and I think the production will come." — Chudzinski said that he has spoken with WR Davone Bess but would not give out any details on the family issue that he is dealing with. "I have reached out to Davone," he said. "He’s going through a personal matter, a family issue. We’re giving him support and beyond that I won’t go any further than that. That is up to him." — DL Phil Taylor suffered a concussion during the game and OL Jason Pinkston came in Monday with concussion symptoms. TE Jordan Cameron still has not been cleared from his concussion. Also injured were DL John Hughes (knee sprain) and DB Joe Haden aggravated his hip injury. — Browns defensive backs coach Louie Cioffi will have surgery for a broken bone he suffered during the game when Jets QB Geno Smith ran into him on the sidelines.